Jugglers from Sydney and from around Australia were well represented at the European Juggling Convention (EJC) this year. The convention was a great opportunity for Sydney jugglers to meet circus performers and traders from around the world. One highlight was meeting Alex from Oddballs juggling shop in London who kindly spent time chatting with us. We love the Oddballs juggle dream juggling balls which are making 5 ball patterns much easier to accomplish. We’re very grateful to the people of Lublin in Poland for hosting the EJC and to the European Juggling Association for their hard work in organising it. At home in Sydney, we are currently working hard on corporate events, kid’s parties, and openings. Visit our juggler pages if you want some unique entertainment for your special occasion. Sydney Juggling is still meeting once a week in air conditioned halls. These are free meetups and details can be found on our meetup page. There are lots of EJC videos on our Instagram and of course you can drop us an email at any time. Remember as our friend Concertino says. Juggling, in Sydney, is beautiful. Winter is here and Sydney jugglers continue to juggle balls, rings, clubs and hats, despite battling freezing fingers and colder weather. That’s why it’s great to have air conditioned halls to juggle in. However, we are lucky to be juggling in Sydney. The temperature rarely dips below 10 degrees Celsius and that’s at night, and during the day there is usually sunshine, so heading to the parks to juggle is possible. Unlike Europe, we don’t have to battle snow and ice and slippery grass to throw things in the air and catch them. Sydney jugglers are preparing to go to Europe to enjoy the The European Juggling Convention. It’s in Poland this year and we hope to meet many jugglers from around the world. European juggling has a unique flowing style which brings a beauty and balletic quality to the juggling art. It is a joy to watch and difficult to learn. 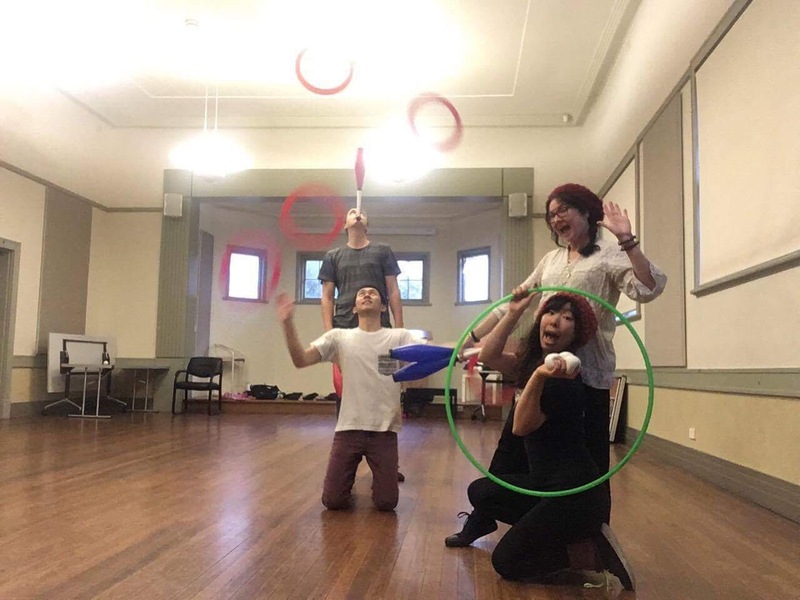 Sydney jugglers are also a joy to watch and they will bring beauty and amusement to your corporate event or kid’s party. Just contact them to find out what they can do for you. Next week our friends at the Sydney Trapeze School are having a circus caberet night. It should be a great show, there may even be some juggling! As we battle the cold weather and prepare our props for the long journey to Europe, we wish everybody a safe and peaceful week. Despite a completely chaotic world, Sydney Jugglers continue to bring joy, laughter and astonishment to everyone by juggling balls, rings, clubs and sometimes doing all three on unicycles. World juggling day was a great success with about 50 people in attendance. There were young jugglers, old jugglers, Sydney jugglers and international jugglers. A good time was had by all. Many there were honing their skills for corporate entertainment or kid’s parties. A juggler is a great addition to a special event and Sydney jugglers have the experience and skills to make your occasion a memorable one. July is EJC (European Juggling Convention) month. Nine days of juggling and more juggling with lots of shows from world class entertainers. At least one Sydney juggler will be performing and others will be attending and picking up whatever juggling skills (and gossip) they can. Juggling is good for the mind, the spirit and the body. It brings happiness, fulfilment and challenges. Once you pick up a juggling ball and start to throw, you’re hooked. Check out our pages for juggling meetups and our links if you want to buy juggling balls, rings or clubs. Please note, we strongly recommend learning to juggle while standing with two feet on the ground before graduating to unicycles. At Sydney Juggling, we try to juggle as often as possible but it’s been raining in Sydney this past week, and there’s nothing worse than trying to juggle with wet and slippery props. Muddy rings, juggling clubs and balls are neither useful nor attractive. Nonetheless, we are still meeting in air conditioned halls once a week, flipping pancakes and turning cartwheels, throwing hoops, rings, clubs and juggling balls in the air and hoping to catch them. Juggling is a great way to spend an afternoon. It’s more than a hobby, it’s a lifestyle. Some of the jugglers in Sydney are professionals and you can contact them for kid’s parties or event entertainment. They’re very skilled and lots of fun. Next week will be exciting. It’s World Juggling Day on Saturday 17th, so be sure to share some love with your favourite juggler, even if they’re not from Sydney. There are special celebratory events all over the world, so if you are a juggler, make sure you join one. If you’re not a juggler, maybe you’d like to become one? We are getting excited about the European Juggling Convention in Lublin, Poland, which is just over a month away. Some of us are going, and there will be lots of news to share from there. Don’t forget to follow our adventures on Instagram, or you can drop us a line to say hello. We love juggling balls, rings and clubs. We love jugglers and juggling in Sydney and around the world. We’ve had a fun couple of weeks at Sydney Juggling. Last month, we loved fidget spinners but this month, it’s all about the circular objects. We had hoop juggling, 7 ring pancakes and roller skating, juggled LEDs at Vivid, and posed for a weird photo. We made friends with international jugglers and more friends of friends who are now our friends. Oh, a big thanks to everybody following us on Instagram, we have over a 1000 followers now which is amazing! Contact us if you want to join us for juggling practice or contact our friends for corporate entertainment, kids’ parties or other events. Have a wonderful week and remember to.. Welcome to Sydney Juggling. A place for juggling balls, rings, clubs and anything else you can imagine, in Sydney, Australia.